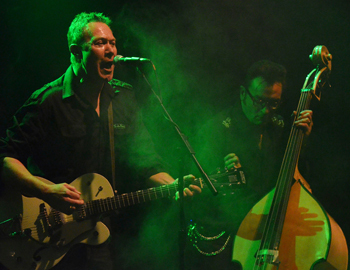 A double barrelled evening of three piece band rock and roll at The Assembly this wet, windy and cold spring evening with first on stage, and giving the evening some added local flavour, hailing from just up the road in Coventry Rockabilly outfit the Voodoo Kings. The last time I saw these guys was at a pub gig here in Leamington and it was fantastic to see them in action on a large stage, always had a soft spot for Rockabilly and especially love the sound and style of a stand up bass. The Voodoo Kings took every advantage of this support slot with a rocking performance that included material from the bands up-coming debut album 'System's Green' including the powerful title track itself and older material including the groove filled 'Easy Street' and complete with the odd holler and pumping bass work one of the bands signature numbers the driving (pun intended! )'Voodoo Car'. The Kings put on an all action show and were bathed in green stage lights (the band's trademark colour) with atmospheric, spooky dry ice enveloping the guys for most of the set, they work really well together with guitarist/ vocalist David West and Sam Smith on the double bass interacting superbly, with distinctive looking and manic all action sticks man Terry Downes completing the line up this was an impressive set by the local boys. 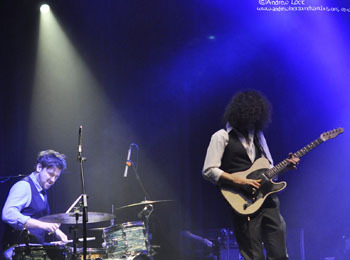 From Rockabilly we turn to the Blues for headliner Oli Brown and I join the ranks of those who proclaim that he is one of the leading lights of the British Blues scene. This was his third visit to the Assembly and for me he just continues to improve in confidence and as a performer. As always he was immaculately dressed, in my opinion blues players dress in one of two ways, the rough and ready informal jeans and tee shirt look as modelled by the fabulous Larry Miller, and the stylish, smart just off the catwalk look as shown off to perfection by the great Joe Bonamassa. Ourur Oli goes for the latter, dressed to the nines. 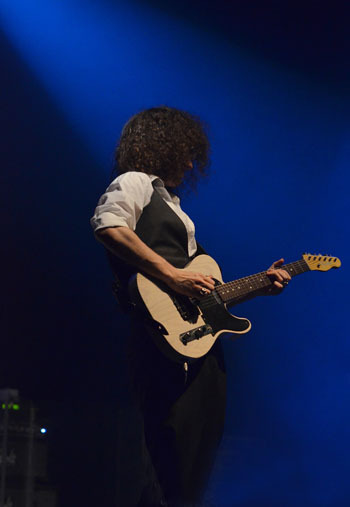 From the most delicate of slow blues passages to the heaviest Zeppelin style rock blues, Oli can play it all with aplomb, and he now has three quality albums under his belt. This show included a good chunk from the latest album 'Here I Am' and a good sized visit to his previous album the 2010 release 'Heads I Win Tails You Lose'. From the new baby highlights included what he called his "pissed off " number 'Manic Bloom' with for me slight touches of Led Zeppelin's 'Dazed and Confused' and a gloriously heavy number it is as well, the heart wrenching blues ballad 'I Love You More Than You'll Ever Know', the smooth 'Devil in Me' and the rocking title track itself. Among visits to 'Heads You Win Tales you Lose' a pulsating 'Evil Soul' and the catchy 'Keeping My Options Open', for the latter Oil persisted and eventually got his way with a little audience participation, another highlight of the set was a superb version of the Black Keys number 'Next Girl'. 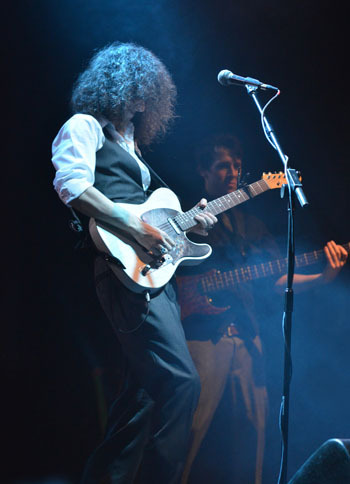 Added to Oli's amazing prowess on blues guitar, his superb vocals and stylish image he also possesses genuine charm, is softly spoken, amusing and off the stage he is very approachable and happy to meet and greet his fans. Playing alongside Oli as well as on the new album and supplying the backbone for his electrifying guitar work two superb musicians, on one side of the stage on rock solid bass Scott Barnes and on the other a drummer of real quality (and for a change front of stage and well lit for us photographers!) Wayne Proctor. As impressive as always, Oli continues to go from strength to strength, always delivers live, and in my opinion is this country's very own Joe Bonamassa. I also loved his walk through the crowd playing for one number showing he knows how to really put on a show as well. Roll on Leamington visit number four.